Edited by DivineHate, 10 March 2019 - 01:47 PM. Edited by DivineHate, 17 March 2019 - 12:40 AM. Lots of grinding, tech locking against 3 enemies (no nukes while enemy has), very limited build space and almost no money in the first phase of the mission. 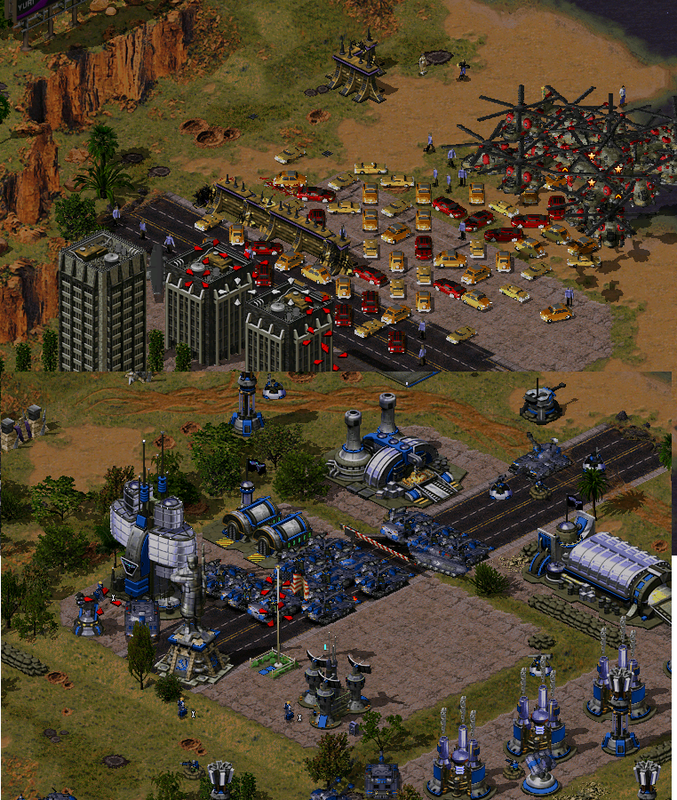 The player might get a one nuke or two, what might be quite a big blow in such a small build space. Unfortunately AI makes big blobs of navy units that idle most of the time, also please ( ) stop the AI spamming units like crazy (I've got almost no money and I must grind through sea full of Piranhas, subs and annoying Elites). The first part of the mission can be really frustriating - the difficulty peak is quite strange because the beginning is very hard but once the beacon is captured, it becomes very easy. Also, why do the Allies fight against me too after some time? As for the bugs, there may be a performance drop because several units will gather and block each other in these spots. Civilian cars spawn offmap and gather in this place all the time, Allied units are in the same cell what prevents them from moving. Also, why does the Epsilon base have offline power ? I destroyed all of their Power sources and they still are not offline. Edited by Martinoz, 17 March 2019 - 03:43 PM. Edited by DivineHate, 18 March 2019 - 03:13 AM. Edited by DivineHate, 23 March 2019 - 08:23 AM. Edited by DivineHate, 25 March 2019 - 09:38 AM. I kinda broke the map by skipping the helicopter ride (and thus saving Tanya). After that you can either slowly destroy all their bases or infiltrate the lab and let the mission continue as it's intended, but with Tanya to help you. @DivineHate Well, that just happened I guess . Yeah, and I forgot the most important part : how I actually did it. I've simply placed Tanya near the wall and let the enemy tanks destroy it for me with their splash damage. Then I carefully snuck to the outpost with the pillboxes where the Stallion was supposed to land while avoiding the Vultures. The Guardian GI from the outpost was also quite helpful. Edited by Terminal Velocity, 25 March 2019 - 06:26 PM. Edited by DivineHate, 30 March 2019 - 05:17 PM. The concept is pretty solid I'd say, it was quite fun to play. There's one very serious issue with the map, however. 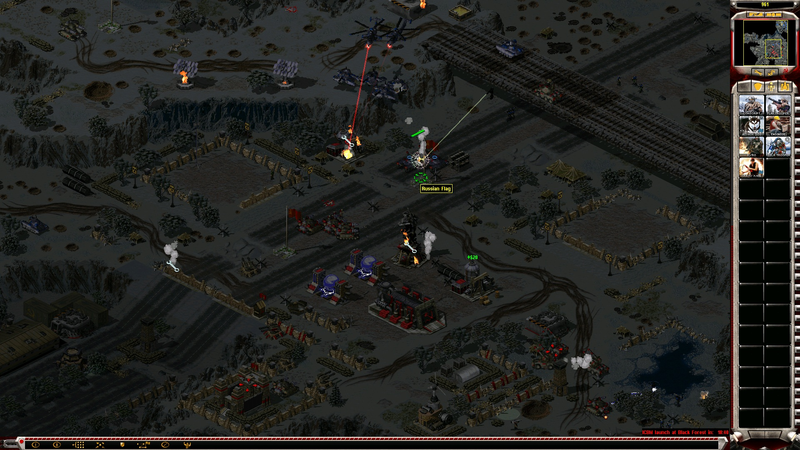 Sometimes destroying the Topol-M platforms wouldn't cause a game over, no idea why exactly. In one of my games I've even lost both platforms and the game just went on as if nothing happened. At some point in time you'd get a buildable MCV, not sure if intended. Who knows, maybe that's the reason I wasn't able to beat it on Mental (since I've never tried building it, I mean spending 3k credits + waiting forever for it build to get base defenses doesnt seem very profitable, especially considering you'd be pretty low on money at that point in time). I've tried the mission like 5 times on Mental, but I would just get overrun when there's like 8 minutes left. Edited by Terminal Velocity, 30 March 2019 - 08:33 PM. Hey, sorry if this is the wrong thread, but I'm trying to make a lunar map and I can't seem to find the space engineer and mutated brutes from Earthrise. I'm not sure if some sort of script needs to be triggered for them or if they're just hidden from the unit lists, but does anyone know how to get them working? Right now I'm just testing all the features of the map editor (like enabling cosmonauts and disabling other infantry, which worked) since I'm almost new to this stuff, and it's going really well so far. This is the only thing that's really halted me. Assuming all goes well, I'm planning to make a simple skirmish map and then a larger challenge-inspired map just to see all the scripting I can figure out. Edit: I know about how there are units in missions made specifically with ini editing to only exist there, such as the super Apoc tanks or the Kirov flagships. I assume space engineers and moon brutes are the same, and they'd probably be simple to set up if only I knew the ini info to give them. I know MO ini files are locked away to prevent broken updates and cheating and such, but it'd really help if there was an info thread somewhere with a list of unit image names and what you'd generally need to make a mission-unique unit. Edited by Picodreng, 31 March 2019 - 01:39 AM. I haven't been able to check, but I think giving Engineer the Cosmonaut image would work. Space Engi appearance are kinda Cosmonaut but on ground, and flying infantries in vanilla usually has walking animations when they are not flying. Edited by Handepsilon, 31 March 2019 - 05:07 AM. While technically this is correct, there are two issues: it will use Cosmonaut's cameo and there will be no wrench symbol like all engineers have. @Picodreng: Space Engineer's image = SPACE, and TBRUT is the Brute one. Thank you! They both worked. Bit late, but if you want to use a campaign only unit in your map, you should definitely check out this map: https://forums.revor...attach_id=42005 from this thread: https://forums.revor...its-available/. That should pretty much give you everything you need.